Two main issues are being tackled in this content and both of them are associated with the Galaxy S5 email. "Authentication failed" or "No response from server"
If you too have encountered the same error message when trying to setup an email account on your Galaxy S5 and still in need of some help, then I suggest you read on this entire content. Before you start performing any of the troubleshooting methods, we suggest you first consider the possible causes. Knowing what might have caused such error prompts to occur on the device is crucial in getting the best and quick resolution. Mobile data is disabled on the phone settings. Incorrect server information is used in the setup. Airplane mode is turned on. POP3/IMAP or Microsoft Exchange ActiveSync is not supported by the email service. Account is inactive or improperly set up. Signal or service is not available. Network outage affecting email services in the area. Now that we've enumerated the possible causes, it's time to isolate the problem or find out which among these causes is really triggering the errors to occur. Follow these methods to help you isolate the problem. 1. Try to access your email account using a computer. Doing so will help you determine if there are outages or issues with the email provider's servers. 2. Check your account status and make sure it is in good standing with your service provider or carrier. Also verify if you are getting the correct data plan. 3. Ensure your phone is getting enough signal strength. At least two or three bars will be fine. 4. If you encounter the problem only when you are in a specific location, be sure to contact your service provider and verify for coverage in the area where you are having issues. 5. Check your phone for any physical or liquid damages. Sometimes, any of these wrecks can cause a device to malfunction. 6. Please contact your service provider and ask for the correct POP3/IMAP or Microsoft Exchange ActiveSync information for the setup. Sometimes, you may be required to enable the POP3/ActiveSync feature on your account. 7. While this is optional, updating the device software generally helps improve functionality and fixes existing problem occurring on the phone. So we also suggest you to check for any available software updates for your phone at Samsung website. If none of the above procedures have shed lights to your problem, then continue with these recommended resolution steps. After doing each step, we suggest you try to test if the issue persists or already fixed. 1. Try to re-establish network mobile network connection on your phone. You do this by removing the battery from the phone while it's on. Wait for 30 seconds and then replace or re-insert the battery. Turn the phone back on and wait for it to establish connection with the mobile network. 2. Open either browser on your phone and then try to connect to mobile data. To do so, touch Apps and select either Internet or Chrome browser. Navigate to a website or webpage and see if you can connect. Otherwise, proceed to step 3. 3. Try to connect over a Wi-Fi network. Once you are already on a Wi-Fi network, attempt to connect over mobile data. 4. Set up your email account again. If problem persists, proceed with the following settings configuration check. Take note of the error message that prompts during the email account setup and refer to the following resolution steps. 1. Visit the email login page or webmail using an available computer. 2. Try to log in or sign in with the correct username and password. If logging in or signing in is not successful, verify if the username and password you entered are correct. If you aren't sure, please contact the email provider and have them verify your username and reset the password. If you have successfully signed in, ensure you are entering the same credentials on the phone. To check if you are entering the password correctly, touch the option to Show Password. Passwords are generally case-sensitive so make sure caps lock is not turned on when typing your password especially if the characters are all small. Make sure you enter the entire address, including the part after @ for your account username. These errors means that something is wrong with the server settings of information you entered to your email server. To make sure you entered the correct server information, please contact your email provider. For corporate emails or email or work emails using ActiveSync, please contact your local IT department for the server information. 6. Touch Next to continue. 7. Wait for your phone to complete the setup process (if your email server settings are already available or automatically loaded). If you choose Manual setup, you will need to choose the type of account, either POP3 account or an IMAP account. 8. Type in your Incoming server settings, including your Username, Password, POP3 server, Security type, Port number, and Delete email from server setting. 9. Once all necessary details are entered, touch Next. 10. 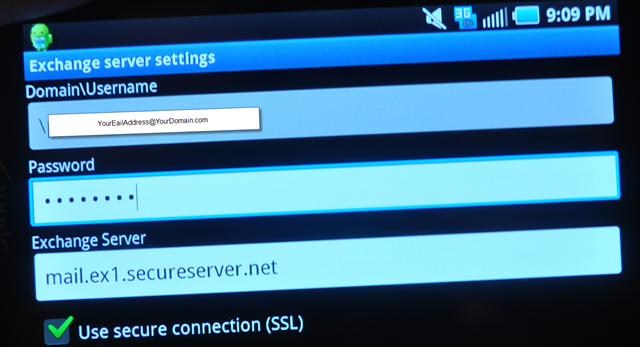 Let your device connect to the incoming server with the settings you entered. If not successful, you will be asked to Edit details. Verify and confirm your settings and try again. If the connection is successful, you will get to the Outgoing server settings screen. Here is where you will enter the outgoing server settings, including your SMTP server, Security type, Port number, Require sign-in, Username and Password. 11. Touch Next to proceed. 12. Allow your device to connect to the Outgoing server with the settings you've entered. If unsuccessful, you will be asked to Edit details. Again, verify and confirm your settings and try again. If connection is successful, you will be prompted with the Account options screen. Make your selections and touch Next when done. 13. Enter a unique on-screen name for this internet mail account. The unique account name will be used to differentiate this account from other email accounts setup on your phone. Enter Your name based on how you like it to show on outgoing messages. 14. To complete the setup process, touch Done. 1. Get to the Home screen and touch Menu. 5. Select Microsoft Exchange ActiveSync. 6. Type in your Email address and Password. If this is not the only email account setup on your phone, you can put a check mark on Send email from this account by default. Doing so will set this email as the default email account. 7. Touch Next to continue. 8. Allow your phone to try finding additional details necessary to setup your account. If successful, skip to step 10. If not successful, you will be prompted with a message saying, "Setup could not finish." Touch Edit details to manually enter additional information. 9. Verify the Exchange server settings are all correct and then touch Next to proceed. 10. Review the Activation screen message. Remove the checkmark from the Always show option, if you prefer not to see this message again when setting up an ActiveSync account. Touch OK to continue. 11. Scroll down to the bottom and touch Next on the Account options screen. 12. Type in the name for the account to help you easily identify this account from your other email accounts on your device. 13. Touch Done to complete the process. If problem continues, please contact your service provider to further assist you with the email setup.